The review boat, a Coraline 750 SF, is a fine example of how far this builder will go in customising to suit a buyer – he even increased the beam by 350mm. This boat is destined for a life in the Kimberley and a prime need was for range; the custom 1,000 litre fuel capacity should take care of that. The review day was also a testing session to select the ideal propeller pitch, so the same weight of ballast was on board to simulate the full load condition. The fuel tank is below deck but the ballast was carried on the deck, raising the centre of gravity and making the prospect of high speed in the heavy swell of the day interesting. Coraline describes the 750’s layout as enclosed centre console. This means the twin seating position at the console can be enclosed by clears to effectively create a mini wheelhouse – useful in rain storms in the Wet. More important to the owner, though, is abundant shade the rest of the time. He specified an aluminium canopy extending aft from the console’s hardtop over the entire rear deck. This is equipped to take a full set of clears, making a weathertight dormitory for extended trips. The rear supports for the hardtop have rungs engaged in them; the hardtop and canopy need easy access to the camping gear loads they are likely to carry. Grab rails around the perimeter serve a double duty as tie down points. The combination of a heavy load and the evolved Coraline hull form delivered the expected first class ride. Taking the big swells at varying angles removed any stability doubts: the sensations were all good. With fuel replacing ballast they would probably be superb. The 750 was a joy to play with: tiny adjustments to power trim set the boat up to deal with the weather from all directions. Behaviour from a fisherman’s point of view was exemplary. That excellent ride to the fishing grounds, followed by stability of a high order once the engine was shut down. 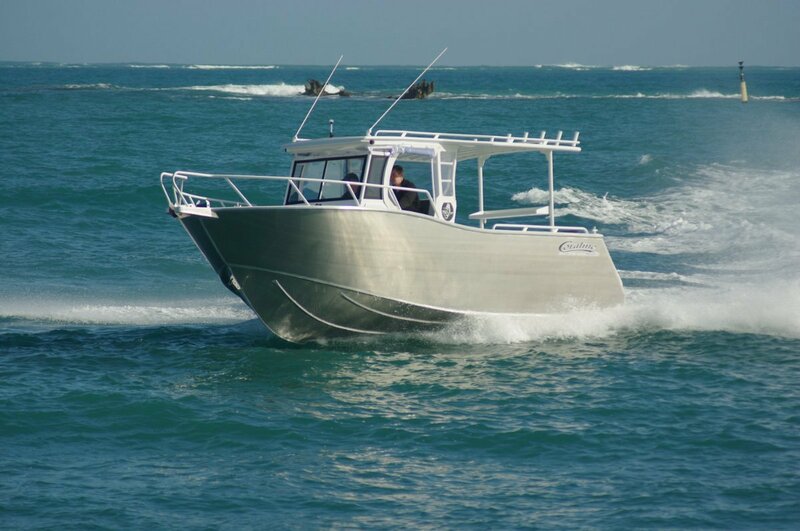 Clearly, as with most Coralines, this 750 is primarily a fishing boat. Its size and centre console style give yardage of rail; exceptionally high rail, especially for a self draining deck. Sinker – or drink – cups appear along it at close intervals. An elevated platform at the bow (locker below) has a socket for a privileged angler’s seat. A bait board is carried by the canopy’s rear supports; the live bait tank is adjacent within the transom. Clean up at fishing’s end is taken care of by an unpowered deck wash. The console is a roomy item with access through doors in its sides and rear. More storage is available in the seat unit through a door in its rear surface for a higher level locker, and via a lower fabric door to a slide out portable fridge. There are more places to stow things generally than is typical for a centre console. Besides the underdeck bow locker there is another under the after deck, two transom lockers and a two-level set of side pockets. Items this 750 does not have are perhaps as significant as those it does. The transom, interior and upper works are painted; the hull is not. This is a deletion I heartily approve of. Not that I dislike a painted surface; I just feel sorry for owners with scratched paint. Unusually nowadays, for a boat this size, a power windlass is missing too. But if you don’t need it why have it?